It’s been a heck of a week! In addition to launching our new website, we’ve also been getting in tons of new products based on the surveys you have been returning! We think you’ll love what we’ve got ready to bring to your home. As always, you can order just by calling 1-800-CANNABIS (226-6224). Yeah baby we like it raw! 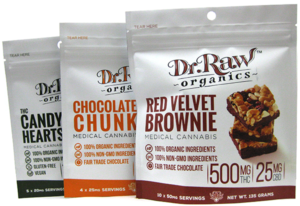 Dr Raw brought us one of the best tasting, and heavy hitting brownies we have ever tasted. 500 MG of THC, wrapped up in an all organic, non-GMO, Chocolate Chip, Cashew and Marshmallow brownie. In addition to this amazing medical marijuana brownie, they also have a deliciously lower dose chocolate chunk cookie at 100mg of THC with 5 MG of CBD and Candy Hearts with 100MG THC per package. You asked for it! Winner of High Times Magazine’s Best Vape Category, 710 King Pen offers a premium hit, lab tested potency and some of the most true-to-type single source extractions around. Available in 500 mg Gelato and King Louis OG cartridges. Leef created an amazing combination of rosin and ice hash. 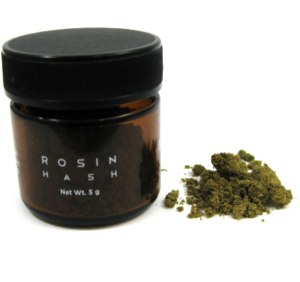 At 5 grams for $50, this is something to keep on hand as a perfect bowl topper or a super booster for your joints. Since it does contain traces of plant matter, it is not suitable for dabbing. Another line you asked for! Kushy Punch’s gummy edibles are delicious, and have a much more pleasant texture than most other gummies. The ridiculous thing is how potent they are. We strongly suggest you start out with half of the normal dose you get from other Gummies, as these have surprised a few of our team with how much punch they really have. If the punch was not enough, take a real hit! Heavy Hitters is a crowd favorite among our patients and drivers, and we are happy to bring them on board! 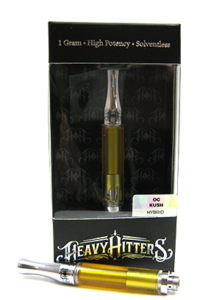 Their carts offer exceptionally big cloudy hits, and are available in OG Kush (Hybrid) and Jack Herer (Sativa). – Strain specific: OG Kush and Jack Herer! 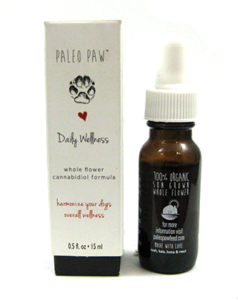 New on our Special Order menu, Paleo Paw is a specially forumlated 250mg CBD tincture for dogs suffering from joint pain, skin disorders, tremors and anxiety. An orally administered tincture with dosing information for extra small to extra large dogs, Paleo Paw takes the guess work out of doggie dosages. You wanted more savory edibles! We heard you, and we tried dozens of them to find one we would be proud to share with you! Yummi Karma came up as the winner with their awesome take on Nacho Cheese Tortilla Chips. 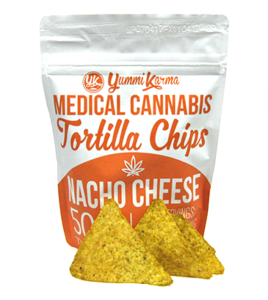 The slight cannabis taste actually makes them taste better than Doritos, adding a barely detectable herbal taste that pairs perfectly with the cheese flavor, while taming the saltiness of traditional tortilla chips. You asked for more pure CBD options, without the THC. 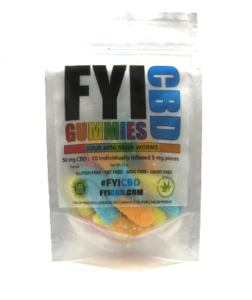 In addition to adding the entire Living CBD line to our special order menu, we are now also carrying FYI CBD Gummy Worms. Each bag contains 50 mg of THC in 10 individually infused 5mg pieces. Perfect CBD micro-dosing for all-day-long maintenance in a great tasting gummy without any of the MCT or alcohol after aste of tinctures.